One of the best-attended field trips in the history of the Conchologists of America (COA) annual conventions was a fossiling foray to a sand and shell-mining operation called SMR Aggregates Phase 10, located in extreme NE Sarasota Co. about a 20-minute bus ride from the convention venue in downtown Sarasota. That day, July 14, 2013, marked the beginning of the collection excerpted in this exhibit. The Pinecrest beds of SW Florida contain one of the most prolific and best-known Cenozoic marine faunas in the world, and much has been written about its biological, stratigraphic, ecological, and evolutionary characteristics, in particular its relationship with the present-day (Holocene) fauna. A sentinel study (Allmon et al., 1993) addressed the question of whether there was a net loss or gain in molluscan biodiversity between the Pinecrest (ca. 3,000,000 years ago) and that found in SW Florida nowadays. There were two important revelations in the analysis: (1) there seemed to be about as many species becoming extinct as originating during those 3 million years, and (2) knowledge of the smallest Pinecrest species, called “micromollusks” and measuring less than 5.5 mm in maximum dimension, was woefully lacking, with only 40 species recognized. The authors actually had to apply a somewhat complex formula, based in part on the better-studied modern fauna, to determine to what degree this element of the fauna had been underestimated in the literature. 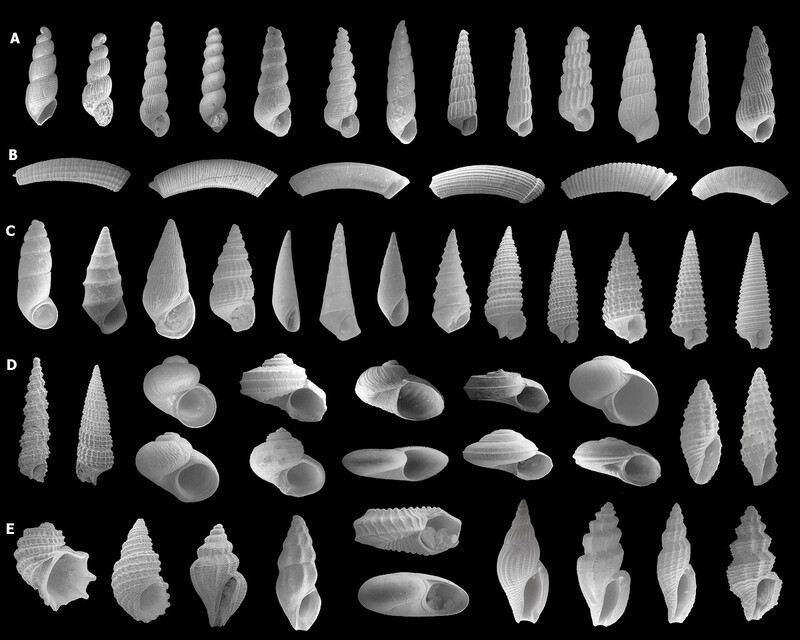 It was determined that about four times as many Pliocene micromollusk species likely existed as were then known, expanding the count to a theoretical 160 species. Based on the collections made that July day, supplemented by several more samplings from the site, the count of Pinecrest micromollusk species appears to be more like 240 rather than 40 or 160. Does that mean that there has been a net loss of diversity in this element of the fauna? Perhaps not! The inventory of the Recent microfauna applied by Allmon et al. (Idem) was soundly based on Rosenberg (1993). However, somewhat unexpectedly, during the two decades that followed that compilation, several major taxonomic monographs have appeared, and well over 100 new species within families like the Cerithiopsidae, Triphoridae, Turbinidae, and, most recently, Tornidae (Rubio et al., 2011) were added to the Holocene Florida/Caribbean micromollusk fauna. Accordingly, whether the final analysis of this now greatly-expanded Pinecrest microfauna will reinforce or call into question the concept of equilibrium in biodiversity over these 3,000,000 years will require some new assumptions and number-crunching. Whatever the outcome, attention to the littlest shells has proven both enlightening and necessary to properly interpret any malacofauna in an evolutionary context. To date, about 2/3 of the micromollusk species found in this Pinecrest exposure appear to be extinct. Further, as exemplified in the captions for the 56 species depicted in the array of scanning electron micrographs (SEMs) below, about 2/3 of these extinct taxa (nearly 1/2 of the total Pinecrest micromollusk fauna) have never been formally named. Allmon, W.D., G. Rosenberg, R.W. Portell, and K.S. Schindler, 1993. Diversity of Atlantic coastal plain mollusks since the Pliocene. Science 260: 1626-1629. 11 June. Rosenberg, G., 1993. A database approach to studies of molluscan taxonomy, biogeography and diversity, with examples from Western Atlantic marine gastropods. American Malacological Bulletin 10: 257-266. Rubio, F., R. Fernández-Garcés, and E. Rolán, 2011. The family Tornidae (Gastropoda: Rissooidea) in the Caribbean and neighboring areas. Iberus 29(2): vii + 1-230. December. Acknowledgements: The SEMs used on the poster were produced in collaboration with Dr. Ann Heatherington, Dept. of Geology, University of Florida, Gainesville, FL. Logistical support in the field and laboratory was provided by Roger Portell, Florida Museum of Natural History, Gainesville, FL. Rick Edwards, St. Augustine, FL, greatly assisted in the culling of specimens. The Sanibel-Captiva Shell Club provided financial support for the production of these SEMs. Row A - L to R: 1. Ebala resticula (Dall, 1889) 2. Falsoebala unknown species [hereafter simply “sp.”] 3. Graphis underwoodae Bartsch, 1947 4. Henrya sp. A 5. Henrya sp. B 6. Murchisonella tampaensis Bartsch, 1947 7. Syrnola sp. 8. T. (Chemnitzia) sp. A 9. T. (Chemnitzia) sp. B 10. T. (Chemnitzia) unilirata Bush, 1899 11. T. Pyrgiscus) sp. A 12..T. (Pyrgiscus) protracta Dall, 1892 13. T. (Pyrgiscus) sp. B. Row B - L to R: 1. Caecum imbricatum Carpenter, 1858 2. C. sp. cf. C. textile de Folin, 1867 3. C. circumvolutum de Folin, 1867 4. C. cycloferum de Folin, 1867 5. C. floridanum Stimpson 1851 6. C. sp. cf. C. bipartitum de Folin, 1870. Row C - L to R: 1. Pelycidion sp. cf. P. matthewi L. Campbell, 1993 2. Zebina clarksvillensis (Mansfield, 1930) 3. Zebinella planata (Dall, 1892) 4. Finella dubia (d’Orbigny, 1840) 5. Vitreolina bermudezi (Pilsbry and Aguayo, 1933) 6. Scalenostoma sp. 7. Oceanida sp. 8. Eulimidae (? )Scalenostoma sp. 9. Cerithiopsis sp. cf. C. parvada Rolán and Fernández-Garcés, 2007 10. C. flava (C.B. Adams, 1850) 11. C. sp. cf. C. iuxtafuniculata Rolán, Espinosa, and Fernández-Garcés, 2007 12. Retilaskeya sp. cf. R. emersonii (C.B. Adams, 1839) 13. Seila sp. cf. S. adamsii (H.C. Lea, 1845). Row D - L to R; upper to lower: 1. Metaxia sp. 2. Cosmotriphora dupliniana (Olsson, 1916) 3. Skenea smithfieldensis (Olsson, 1916) 4. Didianema duplinensis (Dall, 1898) 5. Marevalvata sp. 6. Gelasinostoma elegantulum (Dall, 1892) 7. Macromphalina sp. 8. Cochliolepis sp. cf. C. planispiralis Rubio, Fernández-Garcés, and Rolán, 2011 9. Cyclostremiscus pentagonus (Gabb, 1873) 10. Episcynia inornata (d’Orbigny, 1842) 11. Teinostoma ciskae Faber, 1995 12. Solariorbis infracarinatus (Gabb, 1881) 13. Cymakra pygmaea (Dall, 1890) 14. Glyptaesopus proctorae (M. Smith, 1936). Row E - L to R; upper to lower: 1. Iselica lyra (Conrad, 1835) 2. Iselica globosa (H.C. Lea, 1843) 3. Brachycythara biconica (C.B. Adams, 1850) 4. Lissodrillia sp. 5. Tornus sp. cf. T. schrammi (P. Fischer, 1857) 6. Teinostoma tectispira Pilsbry in Olsson and Harbison 1953 7. Thelycythara sp. 8. Agathotoma candidissima (C.B. Adams, 1845) 9. Vitricythara metria Dall, 1902 10. Glyphoturris diminuta (C.B. Adams, 1850). Images on the plate above have been rescaled (homogenized just for aesthetic reasons). The actual shell specimens shown range in maximum dimension from about 1 to 7 mm, the vast majority being <5.5 mm. They were winnowed under stereomicroscopic surveillance from about one liter of “matrix.” This stuff was dug out from an Upper Pliocene sediment layer before it could be disturbed by the commercial mining operation. Of course, that little sample also included many other tiny species. Red typeface connotes species presumed extinct (36 of the 56 species: 64%). 25 of al 56 species (45%), 69% of the 37 extinct species, designated sp., are apparently new to science.